In my experience, eight years is where the magic really starts to kick in for Wild Turkey 101. While age statements have been dropped from domestic WT 101 since about 1992, the export market (particularly in Asia) continues to see 8-year labels on their bottles (albeit they’re 700 ml bottles). I’ve had the pleasure of having both 1990’s and 2000’s export 101/8’s (some of which I’ve already reviewed), and they range from very good to excellent. Sometime around 2011 the “color bird in profile” Wild Turkey 101 label ended for all markets. It was followed by the cream colored label with the “faded two-toned bird,” which saw its end in early 2015. I thought it would be interesting to compare some of the last of each of these WT 101 8-year export labels. You see, even though these straight bourbons were released within five or so years of one another, due to changes in barrel entry-proof they contain arguably different whiskey. Overall: While I wouldn’t call this bourbon complex, it’s notably complex in comparison to the 2015-2016 domestic Wild Turkey 101 (NAS). I’d say it rivals some of the better modern (post-2012) WT Kentucky Spirit bottles I’ve had. One could also compare it to a spice-forward Russell’s Reserve Single Barrel, but nothing that would rival a decent private selection. The profile is certainly more of the modern Wild Turkey character, but the extended aging has removed the younger “grainy” notes and refined ethanol found in current domestic WT 101. It’s a very nice and tasty “no-frills” whiskey. 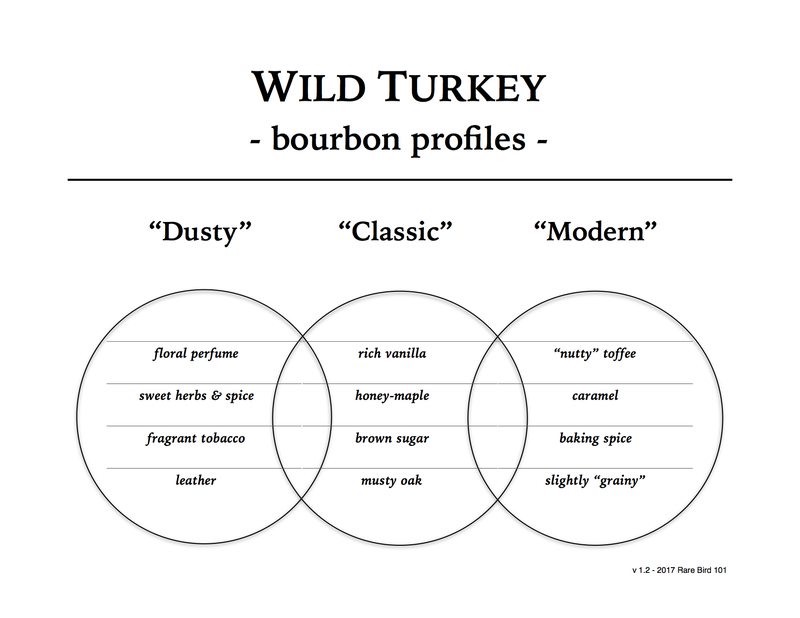 Overall: I’ve been enjoying a lot of 2000’s Wild Turkey expressions lately and this profile fits right in. Even though it’s 2010, and at the end of that decade, it tastes similar to the mid-2000’s domestic WT 101 (NAS). As stated earlier, based on the bottle date and the age statement this whiskey was distilled and barreled at the classic 107 entry-proof. That likely explains the darker color (less dilution) and notes more commonly found with older Wild Turkey expressions. But just because it’s older Turkey doesn’t make it better Turkey. It’s not “dusty” in profile (in other words, it doesn’t taste like 80’s or 90’s age-stated 101), so I want to make sure I don’t give the wrong impression. It’s just a different profile – one more commonly found in WT 101 (NAS) of the 2000’s. It’s classic everyday Wild Turkey 101/8. In summary: While the labels, dates, and profiles are different, these two age-stated Wild Turkey 101’s are each excellent as everyday bourbons. If you can find either of them at retail price, I’d highly recommend picking them up; however, if you live in the United States you’ll need to factor in international shipping. That kills the deal in my honest opinion. If you want the modern 101 8-year export profile, just buy a store select WT Kentucky Spirit that’s received positive reviews. Alternatively, you could opt for a standard non-select Russell’s Reserve Single Barrel and be just as satisfied. As for the pre-2011 label Wild Turkey 101 8-year profile – my recommendation is to hunt or trade for mid-2000’s domestic WT 101 (NAS). It’s great sipping whiskey, but nothing amazing or worthy of “dusty bottle” pricing. If you really want to blow $100 on age-stated Turkey (yes, people are asking that much for these 700 ml bottles), just find a store trying to clear out Diamond Anniversary. At least then you’ll get a full 750 milliliters of a 13-16 year age-stated Wild Turkey KSBW. You might also make the store manager very happy – see, win-win.